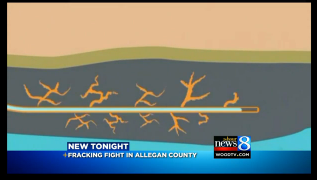 Earlier today, we posted a story about the Fracktivism forum that took place in Allegan last night. We noticed that there were at least two area TV stations present and we also checked various local news sites to see if anything else had been posted about the forum. There was nothing on WZZM 13, WXMI 17, MLive or the Allegan County News. The Allegan County News did post a story on Thursday about the amount of land that was leased at the October 24 DNR land auction in Lansing, but it is unfortunate that they didn’t send a reporter to last nights event to see how people might respond to the increased amount of leases given to oil & gas companies. Both WMMT (channel 3) and WOOD TV 8 had camera crews there last night and we found a story posted on the WOOD TV site and the WWMT Channel 3 site. The channel 8 story was not bad for broadcast news, in that they provided an overview of the issue, talked about the recent land auctions in Michigan and then gave a summary of the forum, with comments from two different people. However, during the story, the WOOD TV reporter stated that the DEQ regulates the fracking wells throughout the state and said, “there has been no adverse environmental effects from the process.” This is a clear example where the reporter does not do anything to verify such a claim from the DEQ. Two of the presenters at last night’s forum pointed out the bias of the DEQ and their limited regulatory capabilities, plus the fact that what the forum presenters were pointing out last night was that there is a difference between the traditional fracking process and the high pressured horizontal hydraulic fracking, which is what is now happening across the state and the country. The Michigan Department of Environmental Quality regulates fracking activity. Communications Director for the DEQ Brad Wurfel said the oil and mineral auctions are nothing new. The DEQ has authorized 12,000 wells over the past 50 years and says there have been no adverse affects on the environment. Wurful challenged the organizers of Monday’s meeting to come up with concrete evidence to the contrary. He says good regulation by the state over the past six decades has prevented any environmental side effects from fracking. “If the industry were hurting the environment, we would ban it,” he said. We need to demand from the local news agencies that they seek out various opinions and voices when reporting on fracking, but they also need to engage in the practice of verifying claims made from anyone cited in the story. The WMMT story did not seeking the DEQ or the DNR for a response to the comments made at the forum, but they did state that they would seek all government documents concerning the possible fracking on public land in counties in West Michigan. The reporter also stated that they would be monitoring to see if the State of Michigan will be responding to the lawsuit filed by the Michigan Land, Air and Water Defense group, a lawsuit that seeks to ban fracking in Barry and Allegan counties.